Cathodic Protection (CP) is the application of direct current to reverse the natural tendency for metals to return to their natural condition as metal oxides (rust). CP prevents the corrosion process from occurring. Corrosion occurs in the presence of moisture. 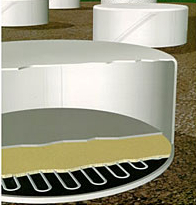 In Above Ground Storage Tanks, it is important, both economically and environmentally, to protect tank bottoms from corrosion. The area under the tank bottom can become moist and can remain moist from ground moisture, under-tank condensation or seam leakage. Present regulations make protection of the tank bottom desirable. Whether the tank bottom is the initial bottom of a new tank, a replacement bottom, or a double bottom, proper corrosion protection is important. In the past, replacement bottoms were installed over the old bottom and welded to the old bottom at the tank wall. This procedure closes the corrosion circuit, making the new steel anodic to the old tank bottom, and in the process accelerating the corrosion process of the new metal. Experience has shown that a properly designed and installed zinc ribbon anode system in the interstitial space between new and old tank bottoms is very effective at providing cathodic protection. This system has been recognized throughout the industry as the most cost effective and efficient method of corrosion control today. Plattline™ Zinc Ribbon Anodes provide a simple and cost effective method of corrosion control for Above Ground Storage Tank bottoms. 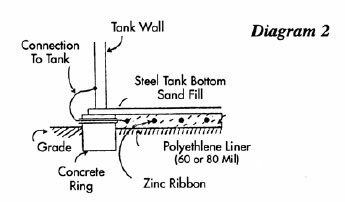 The zinc ribbon is self regulating which means that it will protect the steel tank bottom when the electrolyte (the sand) is conductive (moist) only on demand. When the demand decreases, the zinc ribbon output will decrease as well. No external power source is required. Plattline™ is a continuous zinc ribbon and simple to install. No special tools are required and there is no need for constant monitoring or maintenance once the system is installed. Easy to install. Even distribution of current density. Self-regulating current output. Continuous lengths enable a variety of designs. Normal design life of 20 years or more. Anode configuration is ideal for use in small or limited spaces. Plattline™ Zinc Ribbon Anode can be installed in several ways. It can be cut into lengths and connected by a lead wire along the tank bottom or it can be laid out in a spiral or serpentine fashion in a continuous length along the tank bottom. Each of these installation patterns is illustrated in Figure 2 on the next page and takes place in the sand electrolyte which is approximately four to six inches deep. Government regulations, environmental issues and economics have made cathodic protection of above ground storage tank bottoms increasingly important. Internal corrosion occurs, generally, from crude and other stored products carrying water into the tank. The extraction process of the product itself will leave a water with an extremely high salt content, which settles to the bottom of the tank corroding the bottom from within. This circumstance can eventually cause product leakage – in fact, there are an estimated 20,000 leaking tanks each year in the United States alone. Repair costs, production down-time, product loss, clean-up costs and regulation penalty costs are just a few of the reasons that tank owners have turned to adequate corrosion prevention of AST Bottoms. Plattline™ Zinc Ribbon Anodes are used over other galvanic anode or impressed current systems because the sand between the two bottoms will hold any moisture,thereby creating an electrolyte (a conductor) and corrosion can begin. The moisture is introduced by leaks in the tank or tank condensation. Independent laboratory testing has shown that the pitting rate in highly conductive sand could be great enough to perforate a tank bottom in as short as three (3)years. This electrolyte will activate Plattline™ Zinc Ribbon Anodes and galvanically protect the steel bottom. When the sand becomes dry, Plattline will regulate itself to only become active when the environment is corrosive. Magnesium has a much stronger driving potential, is not self regulating and will consume itself at a much greater rate, thus shortening the life of the application. Also, magnesium is not as flexible a material and does not easily lend itself to various design configurations. A liner is usually installed as secondary containment when retro fitting tanks with a new tank bottom. The anode is surrounded by approximately 6″ to 10″ of clean, dry sand and placed on top of the liner.There are several design configurations used for Plattline™installations See Diagram 1. The specific design is determined by several factors – ease of installation, tank diameter and other engineering criteria. Usual spacing between the anode ribbon is 4 to 6 feet. Once the zinc ribbon is installed, several zinc reference cells are placed in the sand electrolyte. Lead wires to the outside of the tank enable the tank owner to monitor the cathodic protection after installation and the tank is returned to service. Multimeters, or voltmeters are used to take these electrical potential measurement readings. See Diagram 2. After installation of Plattline™, the new bottom is then welded in place, checked for leakage and repaired and the tank is returned to service. 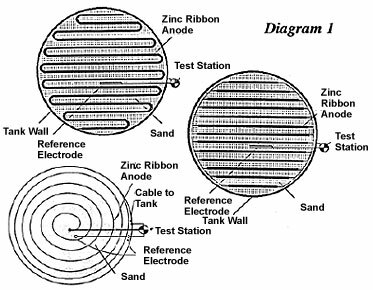 Zinc Ribbon Anodes used in a cathodic protection system only becomes effective when the sand cushion between the bottoms conductive or contaminated with moisture. Generally, the closer the anode spacing, the better the cathodic polarization. Under the right conditions, 8ft spacing appears to work well. Zinc Ribbon Anodes can effectively achieve cathodic protection of a double bottom when the electrolyte resistivity conditions are low enough to allow electrical current flow.